A high quality Large Flange pair of track hubs, front OLN is 100mm, rear OLN is 120mm but will respace up to 130mm with the addition of washers. Rear Axle is 10mm in diameter, Front is 9mm, and hollow for lightness. Overall length of the axle is 165mm. The hub can be spaced to 130mm without swapping the axle. Replacement bearings. - These are the same bearing for both front and rear a 6000-2RS sealed bearing. Have ridden as a road fixed gear bike for only about 200km so far so can't give any long term impressions but the build of the hubs seems good enough and they spin very freely. As the previous reviewer states, they are also respacable down to 110mm which Toby at SJS were very helpful with, even providing me with the thinner washer at no extra charge. With silver Open Pros and 36 silver DT Swiss Revolution spokes the wheels look very nice and should be more than strong enough for my needs. Would maybe have been nice to have had more drillings since I don't really need 36 spokes in the front. 28 would for sure be enough. I probably didn't need to spend the money on Open Pros. I guess I'm weak for double eyelets, they make the build so much easier. The finish is slightly rough around the cutouts on the flanges but to be honest this is getting really picky. The price is good for the quality, I could find rebranded track hubs elsewhere for slightly less but at £60 for the hubset and knowing these are good I'd certainly buy again and recommend the hubs to friends. I worry slightly if they are sealed enough to take on the road but no problems so far. 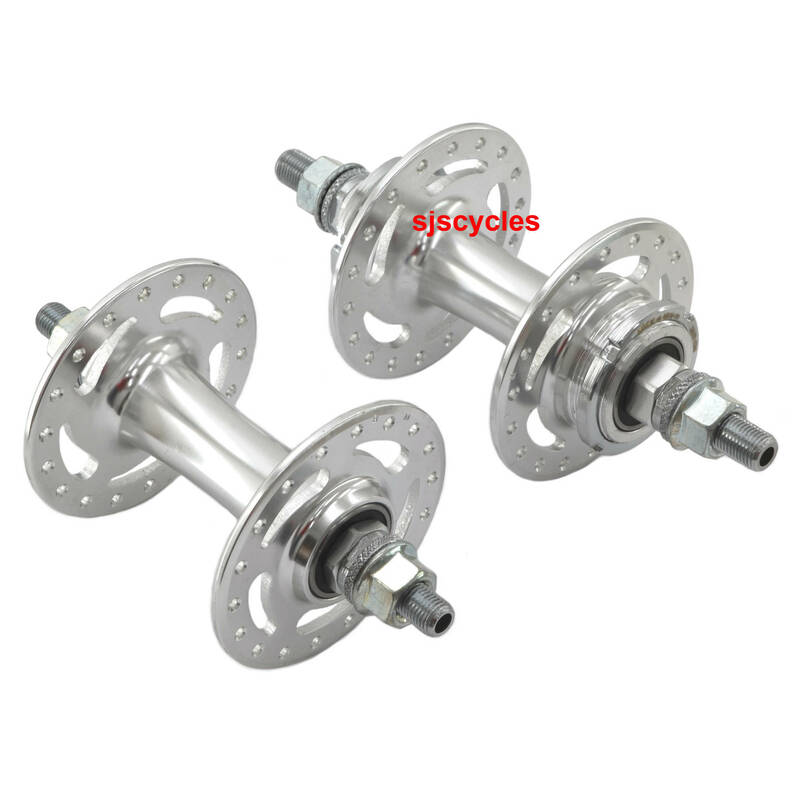 Very nice quality hubs for the price. Excellent finish and good quality spacers and nuts. Bearings seem reasonable quality too, time will tell. I've built these up into a very nice classic-looking wheelset with Mavic open sport rims for my vintage track bike. And yes, the rear hub has been respaced to 110mm very easily. What is the thread pattern for these hubs? 1.37 x24 (sprocket) and 1.29 x24 (lockring)? lock ring 1.29 x24 fits well. Can You Run A Single Freewheel On These Hubs? These are fixed only so cannot be used with a freewheel of any sort I'm afraid. have a 1987 centurion super leman with sakae cranck rebuilded to SS. I wish to build new wheels. I f i use these hubs, how shall I then build the rear wheel: which spores and rims and how to find out the length? If you're planning to build the wheels yourself then you'll need the hubs and the rims to measure them. With the measurements you can use a spoke calculator to work out the correct length. If you want us to build up these hubs for you we can with any combination of rims and spokes you like. I have a lates 50s track frame with 9mm rear drop outs and 8mm (5/16"?) front drop outs. Would it be possible to swap the axles out for one that would fit? There is nothing we'd be able to offer to achieve this, but in theory it is possible. As well as new axles you would need new lock nuts, axle nuts and new bearings to allow them to properly fit within the hub. Do you sell replacement rear axles for these hubs? If not do you know where I can get one? thanks. There are no specific spares available for these hubs, but we do a number of Wheels Manufacturing axles that will match the current axles depending on whether its for front and depending on the hub spacing of the rear.